The Samsung ATIV One 7 DP700A7K is pretty much built on the gimmick of the curved display. While the system is very affordable for such a large display, there is just not much there to support getting it. It is slower than other systems, has major issues with the display brightness and resolution and it is just not very usable. 25.15" x 15.08" x 1.56"
Curved displays are a trend right now for high-end television makers trying to sell large screens. 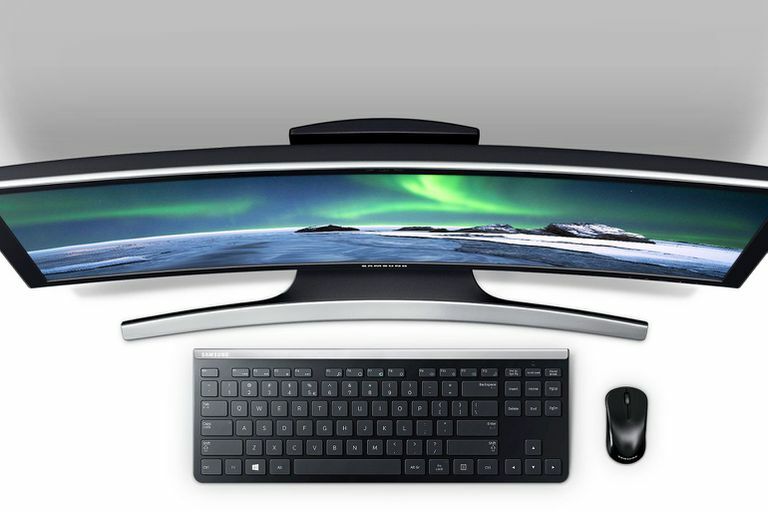 Samsung is one such company that has embraced this trend and they are trying to bring the same feature to the computer world with their ATIV One 7 DP700A7K all-in-one PC. It features a 27-inch display with a subtle curve to it. The system is quite minimal with all of the internal components packed inside of the display The company also touts a number of features for integrating it with their mobile phones but this mainly adds bloat to the software running on the system. Using laptop components is a fairly common practice for all-in-one systems as they use less power, require less cooling and fit better in compact spaces. Because of this, Samsung elected to use an Intel Core i5-5200U dual core laptop processor. The problem is that this is a processor typically associated with many ultrabooks and provides performance that lags behind even the most basic of desktop-class processors. As a result, the system is not very well suited for anything but the most basic of computer tasks like browsing the web, media streaming, and light productivity software. Any other sort of demanding application will encounter some significant lag. The processor is matched up with 8GB of DDR3 memory which is typical of most PCs now but be warned that this cannot be upgraded by the user. Storage performance is not much better than the processor. Sure, it features a terabyte of storage from its internal hard drive which is common for many desktop systems. The problem is that it spins at the slow 5400rpm rate. This means that booting into Windows and loading applications takes longer than it should. It certainly is nowhere near what is capable of a solid state drive or even a solid state hybrid drive which would have been an improvement on Samsung's part. If you want to add more storage, there are two USB 3.0 ports that can be used with high-speed external hard drives. This is fewer of the USB 3.0 ports than most other systems and the ports are all on the back which makes them more difficult to reach. The system does not feature a DVD drive meaning that if you want to be able to playback or record CD and DVD media, you will need to use an external drive. Priced at $750 for a refurbished model and $1300 for new, the Samsung ATIV One 7 DP700A7K-K01US is very affordable for a 27-inch all-in-one system.